Roof leaks can be a homeowner’s nightmare. Water dripping into your house is not only annoying, but can potentially damage electronics and cause major damage to the structure of your home. By the time you have water dripping into your home, you may already have a problem — it’s best to avoid that problem with early detection. Here’s a few signs roofers look for. You find debris from shingles in your downspout or yard.Finding shingles or pieces of shingles after a rain is a sure sign that your roof needs work. Patchy roofs develop leaks quickly and leaks may be developing in your attic. You can see missing shingles on your roof. Another sign that your roof needs work. If you can see spots of the roof under the shingles you may have leaks that you can’t see yet but that are almost certainly developing. Call a roofer for an inspection as soon as possible. Water stains.Water stains on your ceiling or walls may look like a large puddle or a small discoloration. Look for mold, moisture and other signs of a leak. Bulging or drooping ceilings and walls. Sheetrock ceilings and walls can absorb water and show signs of drooping or buying even before water stains are visible. These bulges may feel moist to the touch. After a heavy rain look in your attic.Look for signs of water or moisture. 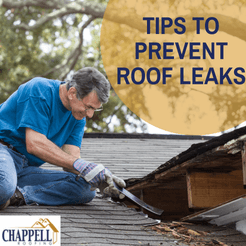 You can follow trails of moisture up the roofline to find the source of the leak. We all know that water runs downward and so leaks can always originate higher than the point that you first find them. When you find a leak it’s always best to schedule an inspection as soon as possible. Early detection of roof issues save money, time and hassle for you. If you like to talk about possible roof leaks or other issues, please contact us!